As I wrote in this blog in November 2008, Irene Fernandez was a true Malaysian hero. She took on a corrupt, abusive and uncaring government that treated the most vulnerable among us without dignity and compassion, and she prevailed by the sheer conviction of her cause and true grit. She fought for all of us to make our country a better place. Her death was met with silence from her government and praise from many all over the world. Much of the praise that came from foreign governments were, however, self-serving. They praise the persecutors for their moderation while honouring the persecuted for their endurance! Irene Fernandez, a champion of the oppressed in Malaysia whose indefatigable advocacy for better treatment of foreign migrant workers prompted her government to denounce her as a traitor and human rights groups to shower her with awards, died March 25 in Serdang, Malaysia. She was 67. The cause was heart failure, Human Rights Watch said. Ms. Fernandez abandoned a career as a teacher in her early 20s to fight for social causes. 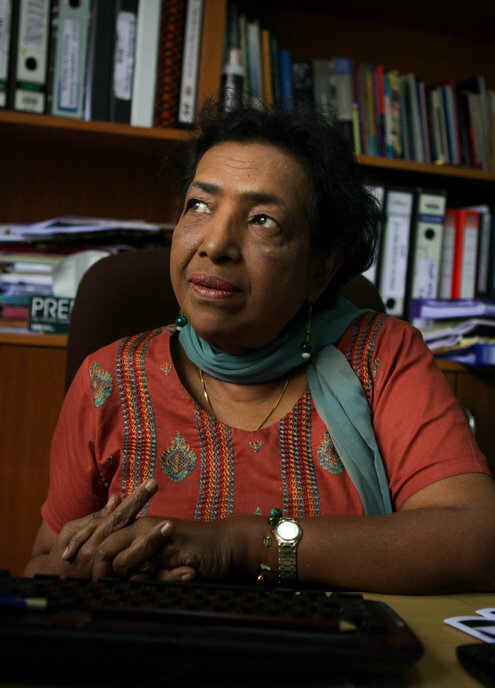 She helped organize the first textile workers union in Malaysia and campaigned for women’s rights, improved consumer education and safer pesticides. Her signature crusade was for the rights of the poorest, most marginalized people in her relatively rich country: the migrant workers who do the dirty, ill-paying jobs many native Malaysians snub. Foreigners account for more than 16 percent of the work force in a population of 29 million people, and more than half the foreigners are in the country illegally. As much as their labors are needed, the illegal workers irritate many Malaysians, as their counterparts do in many countries. Some Malaysians join government-sanctioned volunteer groups to seek them out. In September, the government began a campaign to arrest and deport 500,000 of these workers; it said their collective consumption of social services like education was expensive and went against its policy of relying less on unskilled labor. Ms. Fernandez condemned the deportation drive, partly because it failed to distinguish refugees from other foreign workers, she said. Her criminal trial dragged on for seven years, one of the longest in Malaysian history. Stanley Augustin, the prosecutor, accused her of blackening her country’s reputation. She was convicted and sentenced to a year in prison, then released pending appeal. In 2008, an appellate judge reversed her conviction. In 2012, Ms. Fernandez again outraged her government by telling an Indonesian newspaper that Malaysia was not safe for foreign workers because it did not have a legal framework or specific laws to protect them. “When she says something like that, doesn’t she realize that her actions do not help the country or the Malaysian people?” Deputy Prime Minister Tan Sri Muhyiddin Yassin said in an interview with The New Straits Times, an English-language Malaysian newspaper. Ms. Fernandez’s parents were Indians who moved to Malaysia to work on a rubber plantation when the country was under British rule. She was born there on April 18, 1946. She traced her awareness of social and political issues to her childhood, when, as the daughter of a plantation supervisor, she was told not to play with laborers’ children. “I always found that a big conflict in me,” she told The Times. She became a teacher, but at 23 left the security of a government job for the uncertain life of an activist, working for various labor and rights groups, including the Young Christian Workers Movement. In 1991 she formed the organization Tenaganita (the name means women’s force in Malay), which ran shelters for migrants and victims of human trafficking. It eventually expanded its efforts to include men. Ms. Fernandez’s many awards include the Amnesty International Award in 1998, the International PEN Award in 2000, the Jonathan Mann Award in 2004 and the Right Livelihood Award in 2005. Her survivors include her husband of 35 years, Joseph Paul; two daughters, Katrina and Tania; a son, Camerra Jose; and two sisters, Josie and Aegile. She never lost her taste for battle. During her trial, she told The Los Angeles Times that she was ready for jail. “It will give me an opportunity to write a report on jail conditions and see what changes need to be made,” she said. Reprinted from Wednesday’s early editions. A version of this article appears in print on April 3, 2014, on page A24 of the New York edition with the headline: Irene Fernandez, 67, Fighter for the Oppressed, Is Dead.